Pick your poison in this year’s Preakness Stakes at Pimlico in Baltimore. American Pharoah, Firing Line and Dortmund are the three favorites in the winners market and none of the other five competitors have been given much of a chance against the elite. It wasn’t long ago when American Pharoah (4/5 at Bovada) won the Kentucky Derby. Now he has a shorter distance to deal with and the colt will be starting on the inside rail (PP #1). That isn’t great, but this colt proved in the Derby that he may just be a class above the rest. I believe the shorter distance will benefit Dortmund (15/4 at GTBets) the most. Dortmund finished 3rd in the Derby after a strong start. He tailed off down the long stretch, but the smaller distance should suit him. He’ll provide the early speed out of PP #2 and he’s one to watch. Firing Line (9/2 at GTBets) had early speed in the Derby as well, but unlike Dortmund, this colt also had a strong kick down the stretch. He challenged American Pharoah right to last 1/2 furlong. The shorter distance will suit Firing Line too and he’s my pick to win the Preakness Stakes. I also like the fact that Firing Line drew PP #8, allowing the colt to avoid any potential traffic on the inside. There are five other colts in the race to discuss as well, but I can’t imagine any winning. Two of the names will be familiar. Danzig Moon (16/1 at Bovada) and Mr. Z (25/1 at GTBets) were both in the Derby. Danzig Moon finished a strong 5th, while Mr. Z was way back in 13th place. Neither looked like the winning sort in the Derby and I don’t like either colt this weekend. Keep an eye on Divining Rod (12/1 at Bovada) as well. This colt didn’t race in the Derby, but he has had an eventful year with three consecutive top 3 finishes in graded stakes races. Divining Rod won the Gr. 3 Coolmore Lexington Stakes last time out. I’m not sure this colt will have enough in him to place in the Preakness Stakes, but I have him coming in 4th place, ahead of Danzig Moon and Mr. Z.
Bodhisattva (35/1 at GTBets) and Tale of Verve (35/1 at GTBets) are the final two runners. Neither should stand a chance against the elite thoroughbreds in the field. Bodhisattva is only in the race because he’s a local horse and won the non-graded Federico Tesio at Pimlico. Tale of Verve has no graded experience and will finish at the back of the pack with Bodhisattva. 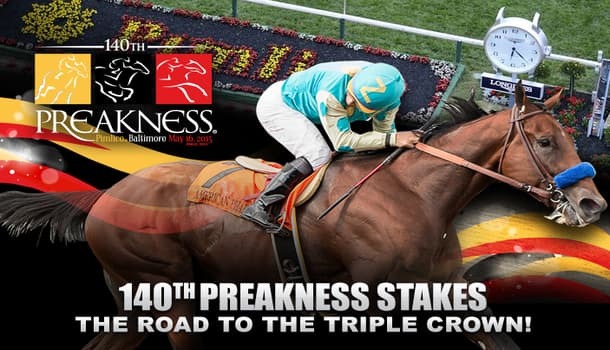 It’s a shame only eight horses are running the Preakness Stakes this year. It’s the lowest number of runners in a long time and it takes some of the excitement out of the race. However, the big three should provide plenty of excitement. It could be worse. Firing Line (1st), American Pharoah (2nd) and Dortmund (3rd) Trifecta. I’ll also have a superfecta will Divining Rod finishing in 4th place. Let’s take a look at some of the match-up markets available at GTBets. Firing Line and Dortmund will have the early speed in the race, but Firing Line appeared to have a much stronger kick down the stretch in the Derby and I expect that to hold true at Pimlico as well. Danzig Moon had a good Derby, but he’s a late closer and that doesn’t work at Pimlico. Divining Rod is suited to the track and I believe he’ll be the biggest surprise out of all of the runners.